I'm always on the lookout for unique, fun inspiring products for children. Little Passports caught my eye, what a neat gift idea! Their goal is to inspire global citizenship in children. It's a monthly subscription service, features two globetrotting characters, Sam and Sofia, who visit a new country every month and share their experiences with your child. Little Passports has been featured in Real Simple, Parents Magazine, on The Talk, and is used by celebrity moms. They are a Parents’ Choice Award Winner and iParenting Media Award Winner. Little Passports World Edition (ages 5-10) - Every month, globetrotting characters Sam and Sofia visit a new country and send your child an exciting package in the mail including a letter, fun and unique souvenirs, stickers, photos, access to online games/activities in their Boarding Zone and more! 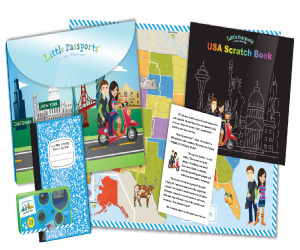 Little Passports USA Edition (ages 7-12) Every month, Sam and Sofia visit two new states and send your child an exciting package in the mail including an activity-packed travel journal, stickers, postcards, pop-out models and access to more information and games/activities online. Currently they are offering a 17% discount on a yr long subscription (first 17 subscribers only). 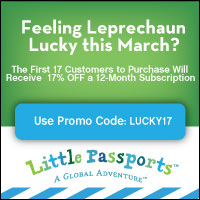 Check out Little Passports here!